This recipe is quickly becoming a favorite of all my friends! The Potato Pizzette (now known as the potato pizza) from Five Points restaurant in NYC was always a MUST HAVE when my friends and I would be dining there. 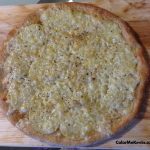 This little pizza is made with thinly sliced Yukon Gold potatos, fontina cheese and truffle oil. The flavors blend together beautifully! I rarely serve this for the main course. I think it’s best served as Five Points does as an appetizer. When I’m having pizza night, I’ll serve this as the first pizza. To make this pizza, i use the same pizza dough recipe that I use for the rest of my pizzas. If you do not use the alfredo, this pizza can be a bit on the dry side, so make sure you use plenty of oil. 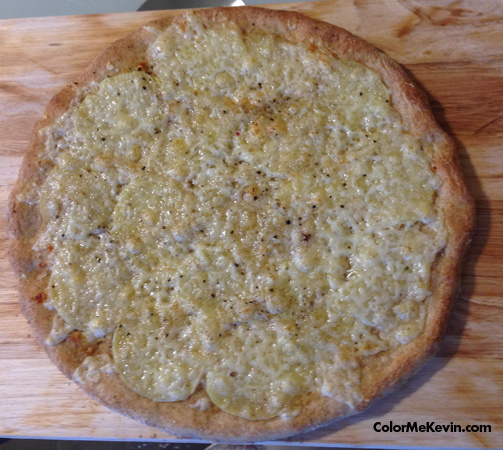 For more tips and trick on pizza dough, visit my home made pizza recipe page.